I have been playing/fighting with acrylics for the past couple of weeks so it is a very refreshing change to be back playing with watercolors! The colors are pretty off in this photo (the paper is creamy white so that gives you an idea of how off my photography skills are) but will take a better one once the painting progresses a bit more. 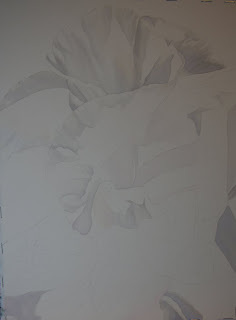 I am just blocking in the tonal values and then will work on adding more layers of colors.